As a model collector, I am really liking these new models. The set looks great bar the stealth device and lack of autothrusters... But I suppose if you´ re supposed to get this in a 1:1:1 ratio with other ships you should be gettin your pairs anyway (is their justification). But Dangnammit! I should have waited a few weeks to paint my Virago. I would have repainted that red one and kept the other Black sun paint scheme. But the guys just got 6 EXTRA POINTS for upgrades! And ultra mobility after the Z´ s go pop! How could you possibly know that scum havoc or nym or cad bane are going to be meta staples? Unless you have some secret squirrel source that the rest of us aren't privy to, you are just pulling guesswork out of your 4th point of contact. I love that old cartoon. So....there are many pages posted since you replied and I haven't gone through them yet. So, I don't know if this has been said yet. I think the reason no one is talking about the StarViper fix is really that it's not that crazy. Everyone knew the points were too high on the ship and it was especially true when you look at the Fang Fighter vs. the StarViper. Some will surely argue that it's not even enough at -3 pts. I'm thinking that it might be a sleeper hit. There are those that love StarVipers and particular pilots. Until they release the new pilot info, I think most people won't really look at the StarViper. It is a lot more viable with the title than before. I think the dial is good, but if you consider dials that are only good for PTL (aka 2 green turns) then you will think it's a poor dial. It's a ship that has Boost and BR, which is good and allows Auto Thrusters. Stats are good at 3 red and 3 green. I actually think his BR change might be a problem in the beginning, but....I don't think I used BR when in the swarm shield. Xizor drops in for Fenn Rau in this squad. He doesn't hit as hard and isn't PS9 but he's probably not going to be the first thing your opponent tries to burn down. It works like a sticky bomb, nothing about a harpoon requires a cable. The idea is you shoot the ship and it lodges in the hull to explode when hit later on. Aaaah - that makes more sense! This is something I would like to try out one day here. PS synergy, also Xizor can distribute some damage to Kihraxz because he doesn't have that good defense because he lacks actions. Kihraxz adds some extra damage to the squad with Cluster Missiles and they have 7 hit points so they can take few hits here and there, wouldn't be bad idea to switch the Shield Upgrades for Pulse Ray Shields and Homing Missiles. I like these new tittles how they open some new squad builds for Scum. But we don't have access yet for all new stuff that we will be seeing here in nearish future, there will be Scurrg H-6, Kihraxz "Vaksai", MK.II Star Vipers and Heavy and Light Scyks. I'm pretty sure that Scum is very close to be complete in some sense, few adjustments to be needed and then we are ready to see how will be the 2018 worlds going! I'm predicting that we all will be enjoying some awesomeness in 2018 world championships, Empire, Rebels and Scum! I hope the world's will be diverse with factions and squads! I have good feeling about this year for all the factions. I hope FFG also feels that way! I think the Firespray would be interesting if they simply errata or maybe add a title that says "You may equip small ship only upgrades." Still has a very limited dial but you can do some interesting stuff. Deadeye, Intensity, Lightning Reflexes, Vectored Thrusters, Cloacking Device... Nothing too terrifying there. Juke? Maybe? It's not great but the Vaksai Title makes my dream team of Fenn, Cobra, and Dengar at least playable. Xizor and three Marauders becomes pretty intriguing too. Large ship deckoak would be terrifying. This card explains the rules for a remote token and serves as a reference to remind players of its effect. 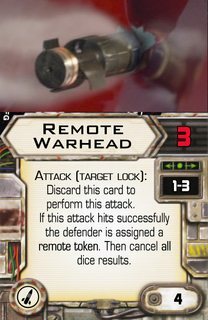 Some card abilities such as "Remote Warhead" can cause a ship to receive a remote token. A ship with a remote token is subject to the following special rules. In any subsequent activation phase the original attacker can choose the Action "Trigger Remote" to detonate the token. The defender and any ship at range 1 of the defender suffers 1 damage. Then discard this token. Ship assigned a remote token which also carry an [astromech] or [agromech] may choose in their "perform Action" step the Action "Remote Removal Attempt". Roll an attack die, on a [critical hit] result discard the remote token. (no plugin for reference cards in Strange Eons then, thus text only). Today likely with condition cards, they were not existing back then, so I designed it as token. Anyone else find it ironic we'll still need to buy the original StarViper just to get Autothrusters? Indeed. This really bugs me. Mindlink swarms have always been possible and they've never been worthwhile yet because more efficient platforms exist. I'm pretty sure bomblet generator only has to do with that new bomb token in the pack. It won't be something for every single bomb. And Cad Bane isn't exactly known for explosives the same way Sabine is, so I'd be hesitant to assume any of the sort either. Scum crew cards often are released with the intent of going on a ship they didn't come with - how many Dengar crew do you see on JM5K? I'm not being "salty" about it, just that when list building for either Rebel or Imperial i notice that a lot of the better options are Scum only. I mean, Scum have the easiest access to action-less target locks via K4 Sec Droid and R4 Aggromech, action-less re-rolls when attacking via Dengar crew, token lock out via 4-LOM, defender defense re-rolls via Zuckuss and R4-B11. Then you have easy access to stress mechanics via Asajj ability and 4LOM pilot, best access to Tractor tokens via Ketsu ability, Shadow Caster title, Space Tug Tractor Array on the Quadjumper and Unkarr, not to mention Ketsu crew which will cripple you long game. From a list building perspective, they have a lot of interesting and useful toys at their disposal, more so than Rebels in my opinion. Regarding your comment about Scum only having one competitive list that never actually won, i.e double IG. Myself and others did see decent success with StarVipers and Headhunters and I recall a number of people winning store/regional/national events with two IG lists. Considering that was there first wave, I think that's quite impressive. The Hounds Tooth and Kihraxz admittedly didn't do much to Scum (i think the arrival of Crackshot actually helped Imperials more) upon release but then it was the very next wave that saw the Jumpmaster release dominate everything. Admittedly, the Jumpmaster has done wonders for Scum, it was a great release for them and still continues to do well. Can't see why this trend won't continue with future releases. Like I said, pure assumption, i'm not even familiar with him as a character if i'm honest! Cad Bane was introduced in the Clone Wars series, which takes place after Jango Fett has been killed but while Boba Fett is a child. They wanted a badass bounty hunter character and so they brought him in to fill the gap. He was especially good at going toe-to-toe with Jedi, so I would speculate that his ability is most likely going to disrupt your opponents Focus tokens or Focus results in some way, as they are often associated with Jedi characters in X-Wing. Indeed, all elite, illicit, and missiles, are upgrades. Free veteran instincts for many a khiraxz. As a general rule when you start to claim the developers have favoritism towards one faction or another you're probably being unduly petulant(salty). Yes Scum have some neat tricks but so do the other 2 factions, effectiveness varies as the meta shifts with new releases. A lot of this is nothing more than whining, every faction has had it's golden moments and Scum is currently in the lead due to the under costed Jumpmaster. Not like this hasn't happened before, nobody remember Phantoms with a crazy 12+ initiative bid? The developers and testers are human and make mistakes, it happens. As for IG's, they came close but never won the big prize. The Xizor list never made it far in the big tournaments if I remember correctly, I enjoyed the concept though. The initial release had 7 Scum ships and only 1 was competitive and the following wave was meh to okay and you think this shows Scum bias? I mean heck people forget that the Jumpmaster actually shipped with another ship, easy enough to do as the thing never sees play(G-1A). As for if the trend continues, one word, Quadjumper. This thing is of extremely dubious value. It's built as a specialist blocker but it has a few key issues. 1. Only one of the named pilots has an ability that's actually effective for blocking. 2. It's not particularly durable 1 more health than a Z and it's all hull. 3. It's 3 more points than our other cheap options in the Z and L.Scyk. It's in such an odd spot, If you want a specialized annoying blocker you're probably better off with the big based Bumpmaster. If you want a cheap annoying ship to fill in a list you're probably better off with a bug zapper Z. The problem is I really want to add upgrades to help it in it's role but that's generally ill advised as investing 20+ points on a 5 health ship with absolutely no offensive power is a bad idea. Given the lack of hype I'm guessing others were scratching their heads on what to do with it as well. It's just annoying that Scum is finally getting an Ace pack so we can get some decent small based ships beside the Protectorate Fighter and stop being shoehorned into big based ships and half the **** thread is people whining that *scum get everything* despite this being our first pack while Rebels and Imperials are already sitting at 2 a piece not to mention their extra pilots and upgrades from the epic ships.